Finkelstein’s argument is that the decline in numbers of the ‘passionate’ and the increase in numbers of the ‘scorekeepers’ accounts for the volatility of electoral politics today. As a narrow structuralist description of politics today Finkelstein is obviously right. There are less ‘passionate’ people around. But the reason is that there is precious little to be ‘passionate’ about in terms of the mainstream political parties. Finkelstein’s description of the ‘scorekeepers’ as looking for ‘alternate teams of possible managers of government’ chimes with the narrowness of politics today. The problem is that a narrow managerial approach to the economy, for example, is precisely what led the British government to allow the credit bubbles to develop which laid the basis for today’s recession. The government saw its role in the economy as merely ‘managing’ the artificially induced boom. Politics is more than managerialism or it is nothing. Politics has to be where challenges are made to the status quo, because the status quo is not good enough. The political sphere is also the place where different interest groups fight out their differences in public in order to convince others that they are right. Not everybody in society has the same interests and the disappearance of class politics in its old form does not change that. Today’s tube strike is a reminder of the fact that not everyone’s interests peacefully coexist with other peoples’. Sometimes confict is inevitable. Politics should be the battleground where these differences of interest and opinion are played out. 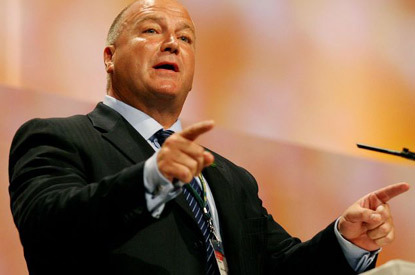 For all his old style ‘class’ rhetoric Bob Crow understands this. That is why he is right and Finkelstein is wrong. A good article by Anjana Ajuha emphasises that innovation in science and technology is by its nature unpredictable. She states that research should not be too narrowly constrained to the supposed needs of the economy. The article further criticises Lord Drayson, the Science and Innovation Minister, for suggesting that spending on scientific research in the UK should be focused on climate change technologies and medical research. 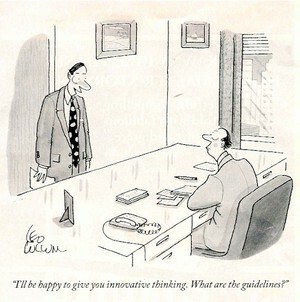 "I'll be happy to give you innovative thinking. What are the guidelines?" Ajuha cites as a better example the approach of the Gates Foundation who are funding research into finding a cure for malaria. The Gates Foundation is funding unorthodox ideas, including some wacky ones like giving mosquitoes a head cold so they cannot smell their potential victims. While I agree with her general sentiment that stuffing innovation down narrow pipes is likely to be counterproductive, since discoveries often happen when scientists are looking for something else, I think she is missing the main point. The work that the Gates Foundation is trying to do is inspiring because it has set itself the task of tackling and solving a huge problem, malaria, that kills millions of people each year. It is extremely well funded out of Bill Gates’ own personal fortune and that of another billionaire, Warren Buffet. I suggest that the reason Ms Ajuha finds Lord Drayson so uninspiring in comparison is because there is no set objective which can capture our imagination. In the absence of a goal that can inspire us, why should resources be set aside on a scale which can transform our society? The best historical example of this is the Kennedy Moon Programme which contains within it both ambition and an ability to galvanise the best minds of a nation. The way that this should work is that we, through our politicians, should set a goal for what we want to achieve. The State then has a role in channelling resources and enabling legislation to make things happen. Real creativity comes from the combination of a goal with the resources available to make it happen. There would then be nothing wrong in choosing, for example, to make the UK a world leader in medical research, but it has to be because we want it, not because a government minister has decreed that is what we should do. My name is Rob Killick. I have written and spoken extensively on tech related issues, especially around privacy and innovation. I summarised my views on the economy in this article in The Times. All of the opinions in this blog are my own. A reminder to MPs who want to Remain.